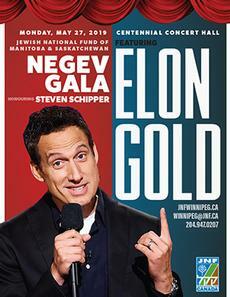 The Jewish National Fund of Canada Manitoba/Saskatchewan Regional Branch is thrilled to announce its Entertainment for the 2019 Negev Gala: comedian and actor Elon Gold in an evening honouring Steven Schipper. Elon Gold has starred in FOX’s ‘Stacked’ and NBC’s ‘In Laws’. He has made many appearances on ‘The Tonight Show’ and had a recurring role on the hit show, ‘Bones’. Elon was also a writer and performer on ABC’s ‘The Dana Carvey Show’ and has guest starred on ‘Frasier’, ‘the Mentalist’, Chappelle’s Show among many others. His one-hour stand up special on Netflix received wide acclaim from audiences and peers alike and is now on Amazon Prime. He recently made a stellar appearance on “The Late Late Show with James Corden” and will be seen next in “Crashing” on HBO in which he plays his most challenging role yet… Himself! "We are so excited to have Elon Gold in Winnipeg for the first time, what a great way to spend an evening : honouring a true Mensch, Steven Schipper, raising funds for a very important Project Beit Halochem and laugh loud and hard with a top Comedian” remarked JNF President Jessica Cogan. This truly entertaining Comedy Show will take place at the Centennial Concert Hall on Monday, May 27 at the JNF’s annual Negev Gala honouring Steven Schipper, Artistic Director of the Royal MTC. The funds raised will be directed towards building the rehabilitative hydrotherapy pool in Beit Halochem in Ashdod, Israel. The Negev Gala has honoured outstanding leaders from within the Winnipeg community for more than 6 decades. This gala is the Jewish National Fund’s most important fundraising event of the year.